MIKRON Receives WMIA Partner of the Year Award! - Mikron Woodworking Machinery Inc.
New Mikron Website LaunchedMIKRON Receives WMIA Partner of the Year Award! Lynn Arbuthnot and Jeremie Paulin are receiving the WMIA Partner of the Year Award from Mike Mendenhall, President of California Woodworking Machinery. Mikron Wins Award, Gives Award Turn-about is fair play for Mikron Woodworking Machinery Inc. of Renfrew, ON. The day after the manufacturer of specialty moulding and profiling equipment received the Partner of the Year Award from the Wood Machinery Industry Association, it doled out an award to its top dealer. 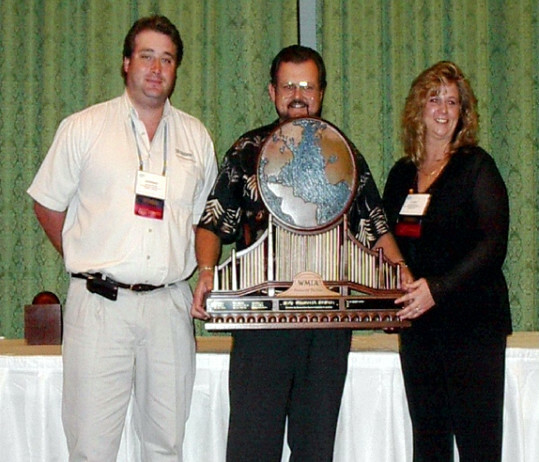 The WMIA Partner Award was presented to Mikron during the Wood Industry Conference held in St. Petersburg, FL. The award recognizes Mikron's achievements in partnering with its North American distributors. In presenting the award, Mike Mendenhall, a member of WMIA's marketing committee, said, "Each year WMIA distributor members nominate woodworking machinery manufacturers and importers and rank them by 30 different criteria in five significant support areas: financial, sales and product, service and parts, marketing, and training." Mikron scored the highest quantitative total based on these rankings, Mendenhall added. The following day, Joe Strouse, president of Hermance Machine Co. of Williamsport, PA, received the Mikron Woodworking Machinery Dealer of the Year award. The award was presented by Lynn Arbuthnot, director of sales and marketing for Mikron.